A bit over a month ago I did a post about us finally getting the baby's room cleaned out. We were ready to start decorating...but the room sat...we did nothing. We knew basically how we'd decorate...no crib because we're doing a Montessori style floor bed....no chest of drawers because we're doing a closet system and probably won't get a chest until we get bigger kid furniture...we'd add a shelf system and seating and such. We planned to be way ahead in getting the room done...but things came up...travel, friends etc and the room set aside. That was until Friday when Staci got the bug to get the room together. After ditching a shelf unit from Room and Board we headed Ikea for something that worked better. It might seem odd to trade down, but whatever...the piece we got has good clean designed lines and is exactly the size we need. 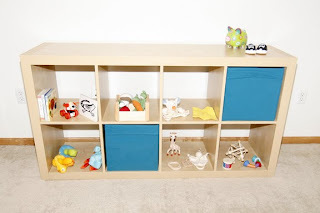 Here's the skinny on the why of a shelf unit...this is coming from the husband of a Montessori teacher...not someone who was schooled in the method, so it's kind of the lay person's view. To oversimplify, once the baby starts exploring the room he/she will be able to grab stuff that is age appropriate...that means some of the stuff here will be moved until it's the right time. Having stuff out in the open allows the baby to explore it's surroundings and builds it's sense of independence. It's especially good because once the baby can come off the floor bed when it wakes up it will be able to occupy itself instead of waking us...but I'm sure it will wake us. But for now the stuff if mostly for us...stuff we think looks good. We really haven't done much...that's the only thing in the room now. But we have an awesome rocker coming and just ordered the mattress and bedding. Then we will add a mirror and bar...it helps with movement. We're going to add a cute chair that belonged to Staci's dad, and we'll add a little side table. 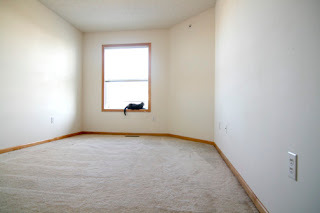 At some point I'll paint the room a lovely shade of white, over a less lovely shade of white, and get the art going. We only made a small step but we now have that momentum we need to get the room done...and we're feeling great about it..and the good thing is we're still pretty ahead of the game.